What do you know about Mexico City? Probably as much as we did, before we got here. Something about slums, bandits and cartels, right? It worked (again) and we found a gem. Parroquia San Juan Bautista in the main square at Coyoacan. It was beautiful and highly ornate. Also a great place to shelter from unexpected rain showers which happened a LOT. CDMX is at a high altitude. The weather is much cooler- which made us love it more. Coyoacan is a proper old-school traditional Mexican town, that got swallowed up by the expansion of Mexico city which now has about 21 million residents. It is a huge sprawling city and our little pocket of heaven had hardly any other western tourists around which stretched my COMPLETELY RUBBISH SPANISH but meant we got a much more authentic experience. See the Coyotes in the middle of the fountain? This was in the town square and Coyoacan means 'Place of the Coyote'. Right around the corner from our rental was Frida Khalo's House, as well as an incredible bakery, churros and chocolate to die for and a town square that was full of street performers, hawkers and locals- the place was busy all the time. It was heaven for people watching and passing the time, walking through it was an event in itself. We used Uber a lot to get around as the weather was pretty changeable and it was cheap. One night we headed to 'Lucha Libre' at the Arena Mexico. We weren't really sure what to expect, our limited Spanish meant that we couldn't decipher the website so weren't even really sure what time the show started- but luckily we got there on time. The man at the desk spoke perfect english when I tried to ask for your 'baratos boletos por favor' (Cheapest tickets please) who replied in perfect english that it would be 900 Pesos (£38.50) for our whole family. Thank you, kind ticket person. We paid up and went into the stadium to a barrage of lights! Music! People selling masks! Sodas, cerveza and popcorn! Every time you looked up someone was walking past with a huge tray on their head, selling something. We tried to stop at one soda, but thought to hell with it and got carried away with two. La Casa de Los Tacos. The restaurant on the corner of our road had the most intense, delicious salsas and moles for the tacos. Easily the best we have ever had- they also served insects which we didn't try despite the waiter trying really hard to persuade us. The dancing girls came on, looking really bored (who can blame them) and then the wrestlers catapulted themselves onstage, and started the theatrics. It was hilarious. At each stage, there was a 'goody' and a 'baddy'- it was obvious who was who. One jumped, the other backflipped and we all laughed, cheered and jeered- when more baddies in capes piled on the goodies and tried to (GASP) pull off their mask! It was more like a pantomime than a sports event. Anyway, we loved it till we didn't, when the sensory overload became too much. then we went home, happy that we'd done it. What a spectacle. On Coyoacan Square. The youngest one, doing an impression of a skull. We decided to head to see the Teotihuacan Pyramids as they were only an hour or so from CDMX (Ciudad De Mexico City). When we woke up we thought we'd get a bus. Then realised we'd need to get a taxi to the bus terminal, then realised we'd need to pay entry and really wanted a guide and the children were in FOUL MOODS... so at 7.15am I threw caution to the wind and emailed a chap called 'Ricardo' (email address is below) who featured in the leaflet that was in our Air BNB house. It sounds like a lot of money, and it was. The entry to the pyramid was 70 pesos each (£12 for all four of us) the bus would have been 100 pesos (£22) but we knew the boys would learn more from a guide than from us reading out Wikipedia. We factored in a few cheap days to shell out for the tour and we were glad we did; it was awesome. Looking down on the Quetzalcoatl temple complex at Teotihuacan. You can see evidence of indoor toilets, which impressed me. View from the top of the Pyramid of the Sun, Teotihuacan towards the Pyramid of the Moon. We arrived, walking through the cactus and the 'Mysterious Cities of gold' theme came into my head. Remember that? 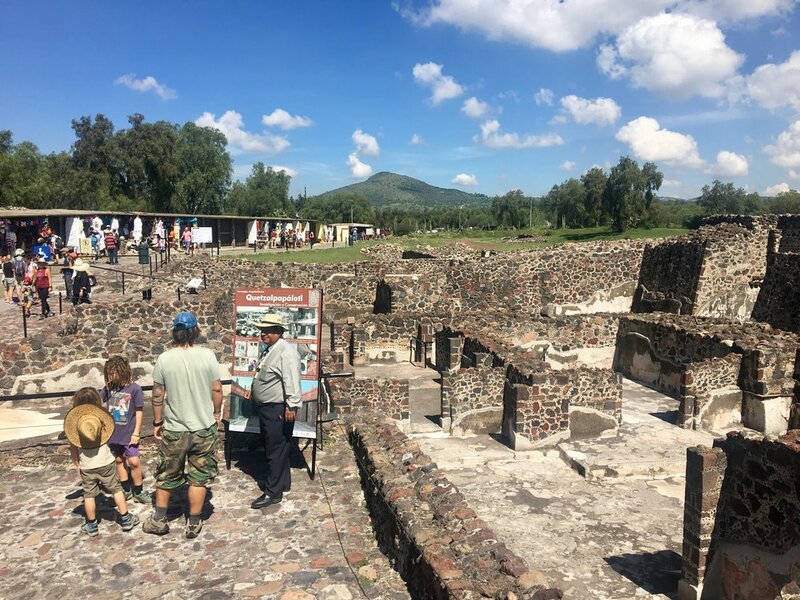 We walked up the medium- sized temple of the Moon and Ricardo filled our heads with knowledge about the Aztec Calendar, how it was calculated and how their month had 20 days instead of 30. Each month a human sacrifice was made of either their healthiest volunteers or their slaves. The view from halfway up the Temple of the Moon (the rest was roped off) was incredible, as you could see the whole Aztec city laid out, culminating in the Pyramid of the Sun. Looking up the steps at the Pyramid of the Sun. The visit to Quetzalcoatl temple was fascinating- you could see how each room was laid out and glimpse the original colours on the stucco. We learned how there was engineering, drainage and amenities in this ancient city. The guide showed us how the dyes were made to paint the walls from shavings of Lapis Lazuli traded from Peru and how they harvested the red from the cochineal beetle's eggs that were mixed with cactus juice and used as paint. We walked up the main concourse and took on the Pyramid of the Sun. The view from the top was... well, breathtaking. You could take it all in and we spent some time wondering why the Aztecs left here. Was it drought? Were they invaded? You could see for miles and the atmosphere was buzzing- to be able to climb up and feel the history beneath your feet was electrifying. We drove home looking at all the multi-coloured houses perched on the hills which, apparently are painted in accordance with their political affiliation. This is where the tourists do not go, Ricardo said... There was me just assuming everyone liked the colour (though I'm sure thats true too). Diego Rivera's masterpiece at the Palace, Zocalo. Zocalo was full of beautiful buildings but also many hawkers and stalls. We were pleased we did not stay here, despite being near all the museums. Diego's work definitely made the journey worthwhile though. It depicted everything from the Indigenous tribal history, the Spanish invasion, the Mexican Revolution and the rise of Capitalism. It brought a lump to my throat explaining the stories behind the fresco which is as relevant now as it was when it was painted 70 years ago. We went out for 4 hours having left the mornings' eggs on the boil. We raced home, I was sure I'd burnt the place down, but the cleaner from the Air BNB had switched off the burner in time. I spent the whole day having palpitations and visions of what would have happened if her beautiful house had burnt down along with our passports. 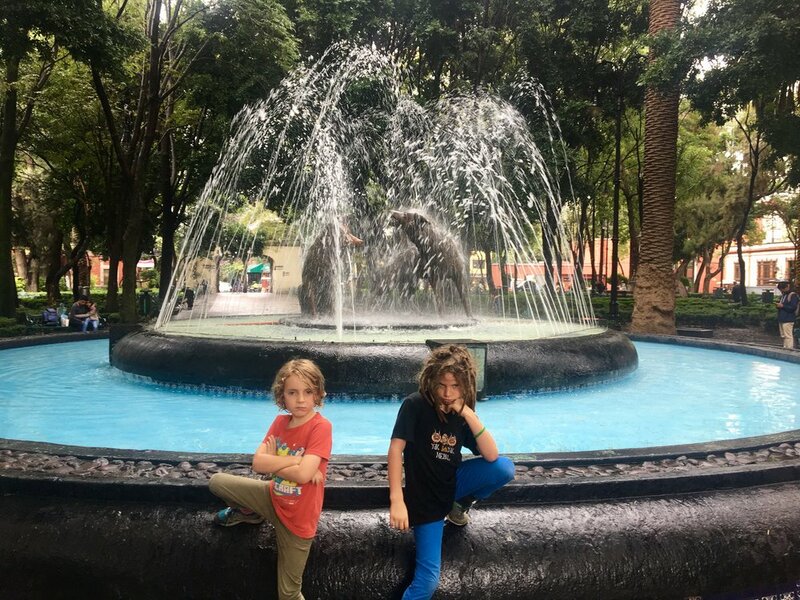 We spent a while wandering around Coyoacan, exploring the local markets and filling our heads with thoughts of Frida and Diego and how they must have gone about their lives in this neighbourhood. Mexico City was a complete shock to us. We loved the tacos, we loved the people, and we loved the vibrancy. The city's reputation for being dangerous is probably well deserved in places, I guess. Though we felt no danger anywhere we went. It blew us away how rich in history a place can be and yet its reputation has seemingly done it a huge disservice. I also loved that I DID NOT burn down the Air BNB house that we stayed in, as I left the stove on all morning when we went to visit Diego Rivera's masterpiece... That was a close call. Not sure our host will want us to visit her again though, somehow. In the meantime, we caught a flight to Merida and started our Yucatan adventure. Chapultapec park. All of the vendors were shouting to advertise their wares. It was overwhelming. There was a zoo- which was free but the enclosures were too small so we left. There was a palace but by the time we got there after walking across the HUGE park in the heat, the SCREAMING at us to buy the cotton candy and the plastic tat, we just went home. Chapultapec Park was not a win for us. Being near Frida and Diego's house was a big draw for us- so we went there to visit on the first day. There is another post coming about our visit, but rest assured, we went there with whistles and bells on. Ana Luisa's house in Coyoacan, via Air BnB £36 per night. Amazing location, lovely host. Chapultepec park. There are so many things to do inside this HUGE park. Zoo, pedal boats, museums, palace.. just make sure if you have young children take snacks and/or pushchair. It is massive. Museo de Frida Khalo entrance is 200 pesos/ £8.50 per adult on week days. Check website for variations and opening hours. It is slightly cheaper to book online. Teotihuacan, one hour away from CDMX. Get the bus or email Roberto who will put English speakers in touch with Ricardo. Email is robert_tours@hotmail.com and cost £86 for a family of 4, door to door service. We used Uber as it as cheap. Flights to Merida in the Yucatan was £50 each via Volaris. Similar price to an ADO bus and much quicker. Unexpected heavy rainfall was a bit annoying, but also quite fun as the rain was warm. Zocalo square is supposed to be huge and beautiful- but it was cordoned off for renovations so we coupon;t see it in all its glory. None of the menus were in English, so with a fussy eater amongst us that made mealtimes a bit of a challenge... but he grew to tolerate quesadillas so that is a win! At Teotihuacan, the hawkers have this thing that makes the sound of a jaguar. Sounds cute? After it makes you jump out your skin 20 times it becomes annoying. Rush hour traffic can treble/ quadruple your journey time, so make sure you travel outside of these times. We totally underestimated the distances in Mexico which are HUGE so transport was more than we had hoped it would be. Don't let it put you off though, seeing the breadth of the country gave us such a good flavour of it and we loved it. Would you like to sign up for updates?